These DC load units, which have automatic control and can interface with the BCT-2000, may be used in both constant power or current applications. Covers are available for DC load units. The Continuous Load Unit (CLU) provides the load during a capacity test. It may be used with the BCT-2000, the BDS monitor, or stand-alone with the Manual Control Box. Load units may be ordered in standard configurations or built to individual customer needs. Configuration and design of the resistive elements let the user adjust the load in small increments through the entire test system capacity. The load units may be used with any Alber data logging and load control unit, or stand-alone. Together, the two instruments create a system capable of providing a maximum range of configurations tailored to customer needs. Covers are available for DC Load units. 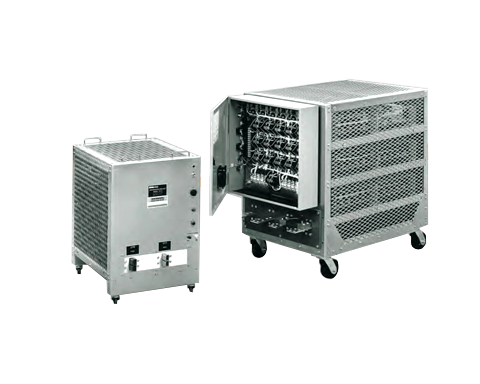 Each CLU is housed in an aluminum enclosure with expanded metal sides and top for excellent ventilation. This enclosure is mounted on lockable, hard rubber casters for portability. The conservative rating of the load resistors and the fan cooling system keep the frame from reaching excessive temperatures. All continuous load devices are rated in constant current, but can be used for constant power testing when used with the Alber BCT-2000 battery capacity test system. Standard units are available from 21VDC to 270VDC. Custom load units for voltages outside this range can be readily designed and manufactured.